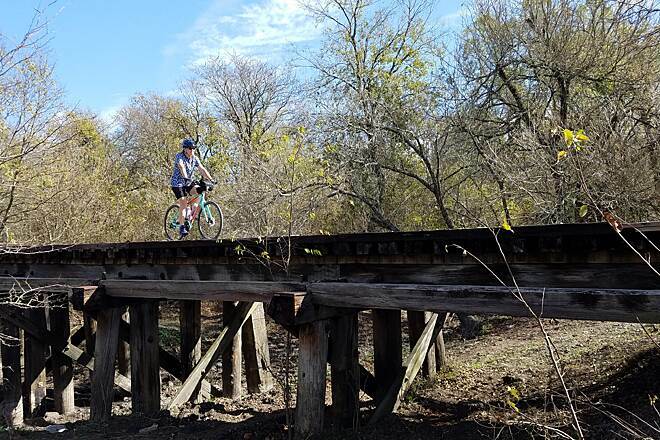 Looking for the best trails around Sulphur Springs? 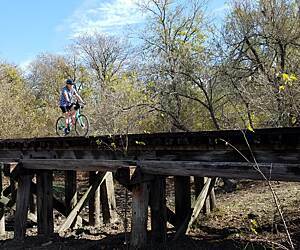 Explore the best rated trails in Sulphur Springs, TX. Whether you're looking for an easy walking trail or a bike trail like the Chaparral Rail Trail and Trail de Paris. 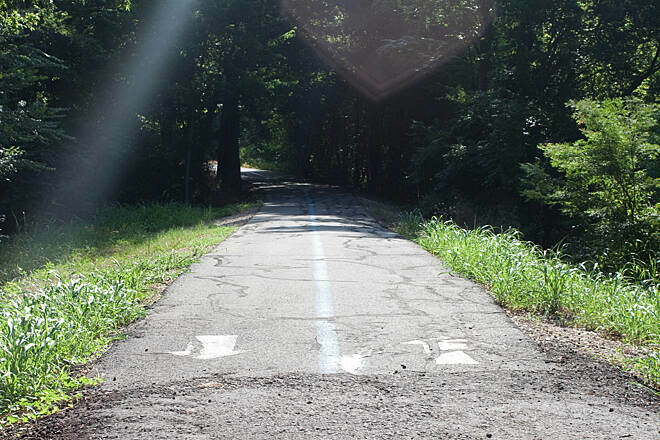 With more than 3 trails covering 43 miles you’re bound to find a perfect trail for you. Click on any trail below to find trail descriptions, trail maps, photos, and reviews. Seems that this trail has fully dried out now. Pretty clear through mile ~17 or so, but a bit overgrown after that. Dont know what folks expect from gravel roads, but this one is easily rideable on hybrid or cyclocross > 10mph the whole way. Maybe even roadbike if your skills are good. Paved for the first ~2.5 mi, packed cinders until ~5mi, gravel after that. 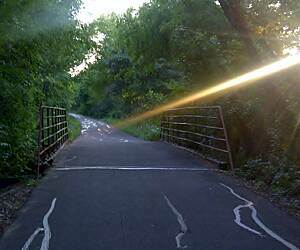 Some of the longer rail bridges are a bit technical (to ride) and could use repair, but none seem unsafe. This trail has been a great place to walk without being out in the sun because of trees on each side. But the city of Paris has decided to clear the trail for about 12 foot on each side. They are not clearing only dead or diseased trees but live ones that shade the trail. I was told that they are clearing because the recent ice storm caused them so much work. How can we keep them from destroying the beauty of the trail? Left Farmersville at the trailhead, It was at first concrete, which gave way to asphalt, then back to concrete, to packed sand, and then to tooth-loosening gravel. Much of the trail is washed out, no doubt due to the heavy precip we've had all through May and June. I wouldn't want to even attempt this trail beyond the packed sand part on anything less than a FAT bike. Also, in much of the trail it is obvious that cars or trucks have been driving the trail, leaving ruts behind. Finally at around mile 8 or so ran into a very large pool of standing water covering the trail, so had to turn around and head back. 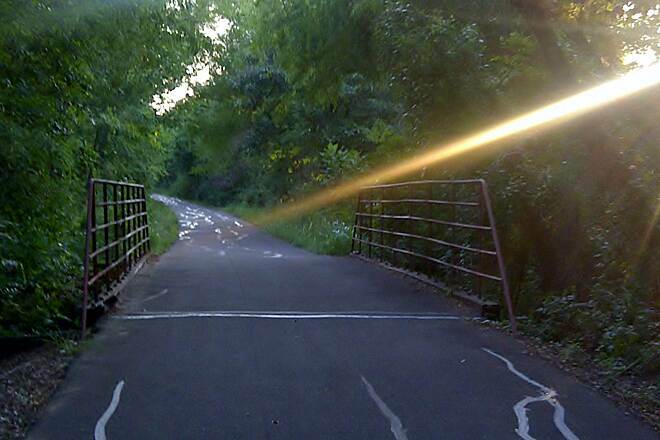 This will be a fabulous trail if whomever is in charge ever decides to actually maintain it. Right now it is pretty much in shambles once you leave the paved portions. We set off for the trail Wednesday March 13 not knowing the trail conditions after quite a bit of rain and little sunshine over the last several weeks. We started out in Farmersville and rode to Celeste. The first first five or so miles were great, paved then gravel. Lots of mud after that, we were up for adventure so we pushed forward mud and all. Bikes gears got gummed up pretty good, we were even washing them in the puddles so they would keep moving. I hope to go back after a few weeks of sunshine to see what the rest of the trail has to offer. I wish this trail was closer to home. My wife and I recently (10/2014) rode this section of the NETT and found it to be a great ride. Gradual climbs,combination of asphalt and crushed stone. Trail is well maintained and beautiful countryside. Combined it with Trail de Paris section. Evidence of good community involvement via resting benches, water fountains,artfully painted trash cans. Lots of friendly folk. Walked some of this trail to check it out. I've been looking for a good trail to ride my horses up to Caddo. And though this trail doesn't dump there it will take me most of the way. Looks promising. In a land were URBAN sprawl is everywhere it's nice to see trails like this to ride on. I keep having to move further and further out because URBAN sprawl chomps up farm lands and then the people that move from the city to live a better life in a country setting want to drag the city with them. So trails like these are paramount to those of us who like to get out into nature and have the ability to hike, bike, horseback ride long distances with out being near busy road ways. This is the fourth of fifth rail to trail I've ridden/hiked/ biked on and I only have this to say for those that want perfect paved trails to ride on. Stick to the city unless you have a mountain bike. 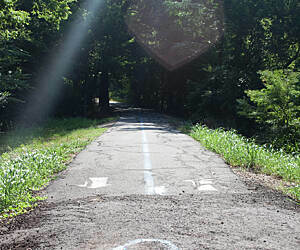 Most Rails to Trails are not perfectly paved or graveled. Though they are kept up well. We love to walk the trail and be surrounded with nature but some parts of the trail are basically in people's backyards. Some people have put up privacy fences but some may not be able to afford to do so. It would be nice if there were more trees or something in between the houses and the trail to make it more like a nature walk.